Rectangle 1. Cast on 6 sts. Rows 1 - 3 -5- 7- 9 -11 : P6. Rows 2 -4 -6 -8 -10-12: K6. Rectangle 2. Cast on 6 sts. Row 12: K6, do not turn. Rows 1 - 3 - 5 - 7 - 9: P5, p2tog, turn. Rows 2 - 4 - 6 - 8 - 10: K6 ,turn. Row 11: P5, p2tog, do not turn. Rectangle 2. Pick up and purl 6 stitches evenly along edge of next rectangle. Rows 2 - 4 - 6 - 8- 10: P5, p2tog, turn. Row12: P5, P2tog, do not turn. Rectangle 4. 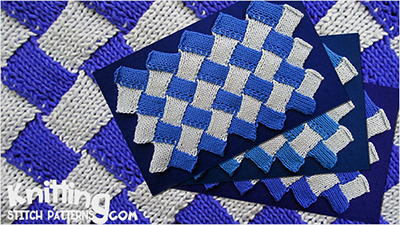 Pick up and purl 6 stitches evenly along edge of next rectangle. Rows 2- 4 - 6 - 8- 10: P6, turn. Rows 1 -3 - 5- 7- 9 - 11: P6 turn. Rows 2 - 4 - 6 - 8 - 10: K5 SSK, turn. Repeat Tiers 2 & 3 until you have reached your desired length. 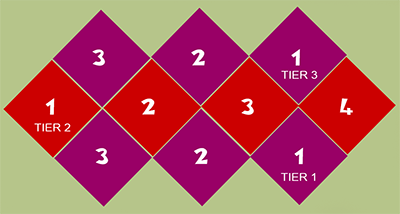 ; end with a Tier 3, binding off last row of each rectangle.